No trip to Krakow is complete without a visit to see Smok Wawelski, the Wawel Dragon, or more accurately, a visit to see the bronze statue which commemorates the dragon of Polish mythology. 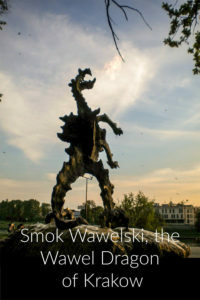 Along the Vistula River, Smok is located in front of his cave at the foot of Wawel (pronounced VAH-vehl) Hill, home to Wawel Cathedreal and Wawel Castle. The statue which stands on a limestone boulder is 6 meters high or over 20 feet. Designed by Polish sculptor, Bronislaw Chromy, it was installed in 1972. When I first saw Smok, it appeared to be waving six arms. Since then, I’ve read that the statue actually has seven heads. Those arms are actually long necks holding the six smaller heads. To make it especially interesting, this is a fire-breathing statue of a dragon. Once every 5 minutes, flames, made possible by a natural gas nozzle, shoot out of the dragon’s mouth. A recently added feature allows visitors to call up the flame by sending “SMOK” via SMS (text message) to 7168. What led to the propensity of dragons in mythology? Whether is was giant crocodiles roaming far more of the earth or the frightening discovery of dinosaur skeletons, it seems like everyone has a dragon, and Poland is no exception. The mythilcal dragon required weekly offerings of livestock because without them, it terrorized the locals, ransacked their homes and devoured their animals and their daughters. Most versions of this story have King Krakus who lived in the 8th century (or possibly his sons) slaying the dragon by offering it a lamb or a calf stuffed with sulfur. 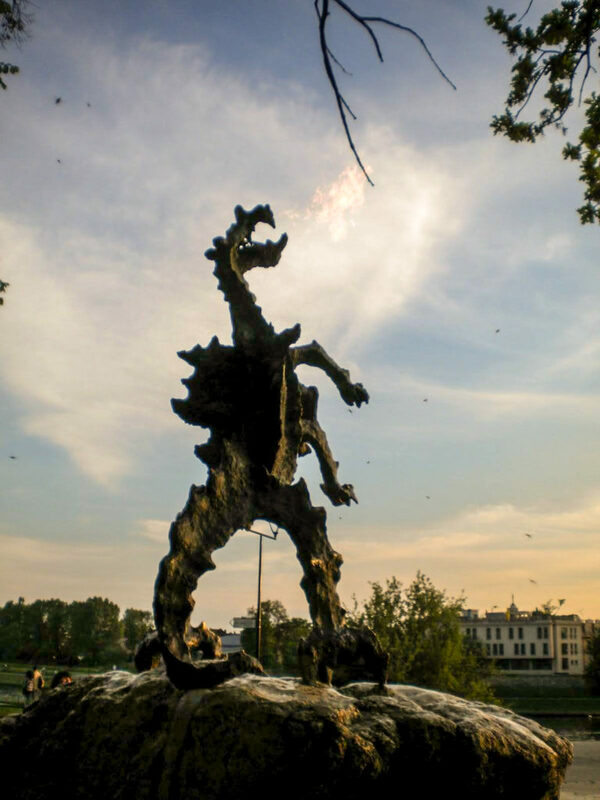 The sulfur burned the dragon’s insides so that it drank too much water from the Vistula River and exploded. One of the earliest tellings of this story is credited to Wincenty Kadlubek, Bishop of Krakow from 1208 – 1218. He was a noted historian and prolific writer. Scholars try to offer explanation for the legend. Simply a war against evil, or possibly the dragon was representative of hostile people living on the hill? The Amazon links above are part of an affiliate program, which means if you make a purchase, Amazon sends me a few cents. In any case, there are giant bones hanging at the entrance to the cathedral, originally thought to be dragon bones. Scientists have since identified them as belonging to a whale, wooly mammoth, etc. Another common theme (similar to one associated with San Xavier del Bac in my home area) when the bones drop, it will signify the end of the earth. On that solemn note, I’ll wish you well until next time. Lois, once again thank you for the history. We will be in Poland in the fall. I didn’t know about the statue so will add it to my “must sees” when we are there. Love your posts, keep up the great work and THANK YOU. I’m glad you found it helpful, Elizabeth. We’re also planning to be in PL this fall. I hope you have a fabulous trip!